Eva’s Place is home to the Family Reconnect program which offers proactive, long-term solutions to prevent and reduce homelessness by helping youth re-establish and maintain contact with their families. Its Early Intervention component supports families staying together rather than having at-risk youth enter the shelter system. Local REALTORS® hit a home run raising $1,281.06 for Southern Frontenac Community Services! On Thursday, September 15th, 2016 participating REALTORS® laced up their cleats at their Annual Charity Lob Ball tournament. A great time was has had by all and a special thank you goes out to the following volunteers: Liza Tallen, Jamie Quinn, Steve Harrington, Samantha Moore, John Dirksen, Ken & Lorraine Rolston, Adam Rayner, Colleen Emmerson, the KAREA P.R. Committee and the KAREA Board of Directors. Thank you! As a long-serving Member and Past President of the Southern Georgian Bay Association of REALTORS® (SGBAR), Wayne Cornfield was recently honoured for his outstanding volunteer service and commitment to the Association. 13th Annual Bowl a Thon Raises $10,250 for the Kingston Youth Shelter! On April 7th, 2016, local REALTORS®, their families, friends and associates laced up their bowling shoes for the Kingston and Area Real Estate Association’s 13th Annual Bowl a Thon! An amazing $10,250 was raised for the Kingston Youth Shelter and many thanks are due to everyone who contributed to this successful event. (December 17, 2015 - Hamilton) Members, sponsors and friends of the REALTORS® Association of Hamilton-Burlington (RAHB) showed their generosity and community spirit by raising $65,950 for the 00CHML/Y108/953 Fresh FM Children’s Fund. The funds were raised at the recent RAHB REALTORS® 4 Kids Charity Auction, held annually to support The Children’s Fund. “On behalf of Trails Youth Initiatives, I thank Ontario Realtors Care Foundation for the recent donation that contributes to ensuring that vulnerable Toronto youth will thrive despite their challenging underpinnings. 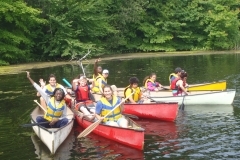 Youth engage in our outdoor adventure based programme at our 153 acre Newmarket site for 1 weekend each month during the school year and for two weeks in the summer." 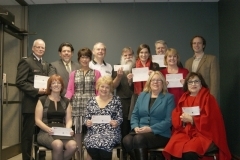 (December 15, 2015 – Hamilton, Ontario) Representatives from nine local charitable organizations were on hand to receive donations from the REALTORS® Association of Hamilton-Burlington (RAHB) on Thursday, December 10, 2015. RAHB President Donna Bacher and CEO George O’Neill presented the cheques on behalf of the Ontario REALTORS Care® Foundation, which is supported by members of the Association. Each year, funds donated by RAHB members come back to the community, to be distributed to shelter-related organizations. All proceeds go to the Royal Lepage Shelter Foundation, going towards helping to support local women shelters! On May 6th, the Woodstock-Ingersoll & District Real Estate Board hosts their 5th Annual REALTORS® Care Food Drive in Woodstock and Ingersoll for their respective Salvation Army food banks. Michael McIntee and Brad Angel presented Habitat For Humanity Grey Bruce a cheque for a $5,340 grant from the Ontario REALTORS Care™ Foundation.